Take a look at the above picture. There is no trick, you should see a face. 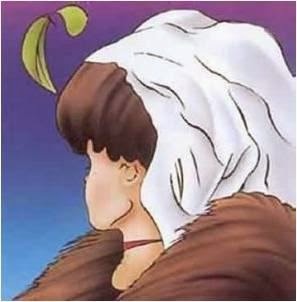 Do you see a youngish woman, or an obviously old woman. I'll be honest, I saw the old woman at first. Then I looked away, looked back, and saw the young woman. I can now switch back and forth at will, but it took a smidgen of practice. This supposedly says something about your right brain vs. your left brain having control, but I am not trying to psychoanalyze people or freak them out over some nonsense like this. So, I won't say what the different interpretations might mean in a Rorschach Test way. But with one, you're a wacko! LOL.